There's something incredibly satisfying about using things up. Today I'll be polishing off my packet of Strawberry Ginger Peppercorn tea. This coming from someone who hates endings of books, visits, movies. This from someone who cries every time she leaves New York City and Chicago. In the case of fibre, using-up means working with what's left. This forces one to work within the parameters of what's left; to make the bits and pieces and remainders work. To make something beautiful from the little that's on hand. And the (strange?) thing is that Something Beautiful never fails to emerge. There's a life-lesson in here, somewhere. So yes, I do believe in (happy) endings. Things need to end before things can start. Did you spin that? It's absolutely gorgeous! February 15, 2011 at 11:13 a.m.
February 15, 2011 at 11:16 a.m.
Rachael -- Thank you! Yes, I spun that the other day. I have more singles from that batch yet to ply. Ariane -- Those are good words to live by. February 15, 2011 at 11:27 a.m. 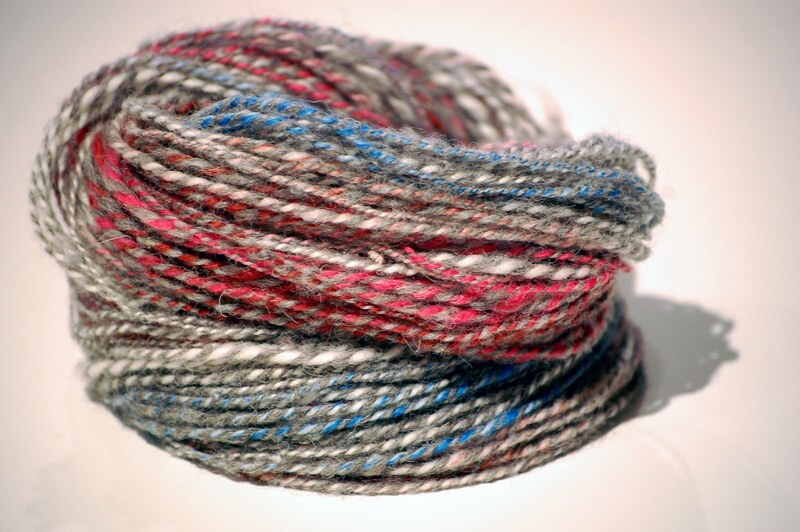 Your handspun is stunning! Love the plying. And that tea looks delish. I'm a total tea nut, too. February 15, 2011 at 2:32 p.m.
Not if you have startitis. February 15, 2011 at 2:41 p.m.
Beautiful handspun! And thanks for the link to the tea....my favorite tea company went out of business. I've been on the hunt for a suitable replacement ever since. 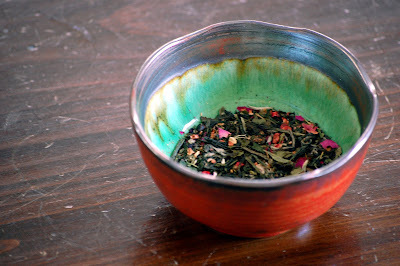 February 15, 2011 at 5:56 p.m.
February 15, 2011 at 11:09 p.m.
Victoria Teas is one of my favorite brands! I found them on a trip to Niagara on the Lake. February 16, 2011 at 3:09 p.m.